Last week marked what would have been the late Douglas Adams‘ 61st birthday, and I should take this (belated) opportunity to thank him for proving to me that although writing is a serious business, it doesn’t have to be entirely serious. The original, having passed through many hands, as evidenced by the vigorously taped spine. As a kid, I’d always been a fan of the absurd. I glommed onto Monty Python and Benny Hill early and shared many long BBC-via-public TV blocs of Fawlty Towers with my dad, mostly to the consternation of my mom, who never quite got what the appeal was. But when I discovered The Hitchhiker’s Guide to the Galaxy, I quite literally fell in love. 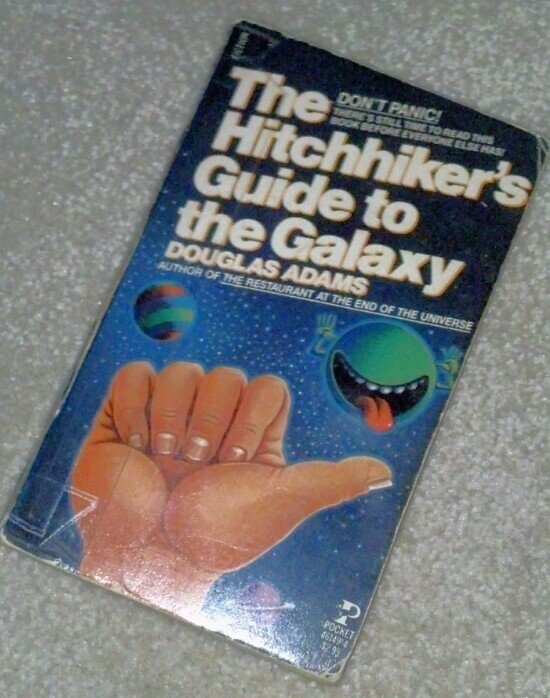 Since my original edition (shown here – the cover held together by Scotch tape) notes that it is the fifth printing of the Pocket Books first edition with a publication date of 1981, I suspect that I stumbled across what would prove to be one of the defining books of my youth when I was in 7th grade. As American readers go – at least for my age group – I always felt that I was a bit of an early adopter when it came to H2G2, as it is now fondly known. Many of my classmates were clueless, unaware that such a perfect melding of sci-fi, satire, social commentary and outright hilarity even existed. 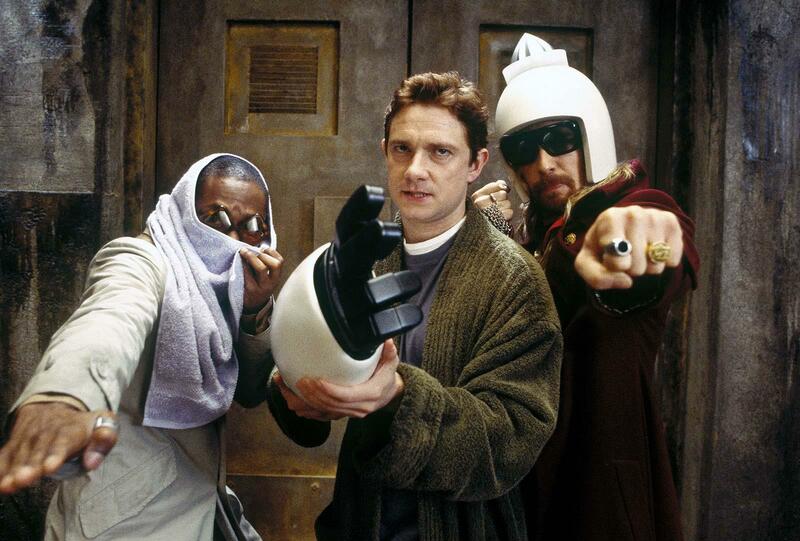 Ford Prefect, Arthur Dent and Zaphod Beeblebrox from the 2005 film version of H2G2. Or, me and pretty much any two of my friends after an evening of festivity. I recall reading and re-reading my copy (thus the tape), then becoming something of an evangelist for the novel, loaning it out to friends who I thought would appreciate it. They, too, became fans, and joined what, for me, was like a special little club of in jokes and cultural exclusivity. Even today, I sometimes have to restrain myself from foisting it on others – my kids included. Thankfully, my son, at 9, has a growing appreciation based on the 2005 film version. He has my full permission to read the novel whenever he is ready. In fact, he noted to me the other night that his copy of The Dangerous Book for Boys (a must for any adventurous-minded lad) lists H2G2 as a must-read. This is a good thing, because I can’t even begin to estimate the role H2G2 played on my development as a writer. I can most definitely trace my style of column and opinion writing, first honed at my high school newspaper, right back to the novel. As I grew as a writer and began to read other novelists and columnists, I always found myself drawn to those that maintained a sense of the patently absurd (Dave Barry and the late Lewis Grizzard, I’m talking to you guys). In fact, I can also trace my eventual discovery of Christopher Moore to my fondness for Adams, and that led me to the legendary West Chester Christopher Moore Codorus Press Ambush, of which I might be convinced to write about some other time. Nevertheless, if you’ve actually read my novel Immaculate Deception, and you also happened to have read H2G2, I wouldn’t be surprised if you saw some similarities. Hopefully they also made you smile.